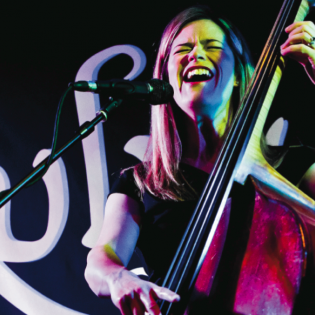 Bassist/vocalist Kristin Korb tours internationally as a performer, clinician, and guest artist with numerous jazz ensembles. While studying privately with jazz bass icon Ray Brown, he arranged for her first recording with his trio, Introducing Kristin Korb, on Telarc Records. Her upcoming sixth album, “What’s Your Story” features her innovative arrangements of jazz standards. Kristin has taught at the University of Southern California where she was coordinator of vocal jazz studies, Azuza Pacific University, Grossmont Community College and was Director of Jazz Studies at Central Washington University. As President-Elect of the International Society of Bassists, Korb is artistic director for the upcoming 2013 ISB Convention in Rochester, NY (Eastman School of Music).